Migration, refugees, crisis. These have become words that are part of our contemporary European discourse. In the media, one can find divergent portrayals of migrants/refugees. Are they seen as migrants or refugees? Are they seen as intruders or people who need help? There are numerous divergent interpretations around the topic. At NIAS, a theme-group is investigating this issue with their project “Reading and Narrating the Refugee/Migration Crisis” composed by Dr Beatrix Futák-Campbell, Dr Roxane Farmanfarmaian and Dr Karin Fierke. NIAS talked with the theme-group coordinator about their research. Assistant Professor of International Relations at Leiden University College, the Netherlands. NIAS Fellow, Theme-Group Coordinator (1 Sept – 31 Jan 2018). Just before the interview started, Dr Futák-Campbell was working on a forthcoming paper based on her research. Futák-Campbell explained that the research project is divided into three parts, in which each member of the team has their own sub-project. In her case, she is collecting data on the four different team-group’s case studies: Lampedusa (April 2011), Hungary train penning (September 2015), Aylan Kurdi (September 2015), Nice (July 2016). Futák-Campbell focuses on media coverages including text and images. 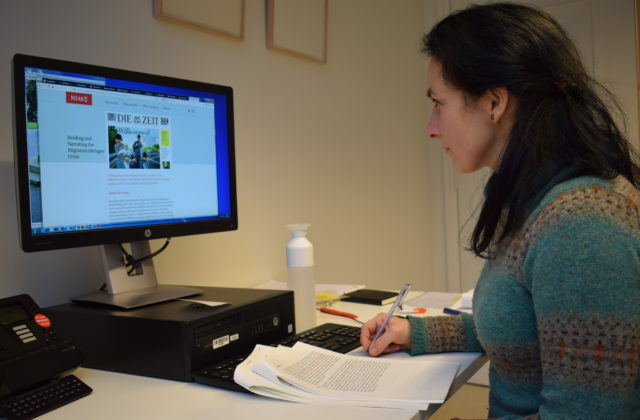 She and her students at Leiden University are also looking at other images such as videos, cartoons, and graffiti. They explore the visualization of how the crisis has come to be portrayed. It was interesting how the media reflected on the events because every national media was portraying how responsive their own governments were and how they are doing whatever possible they could. However, these media outlets also critiqued the lack of or insufficient response from other countries in the EU and also from the EU itself. In a sense, everyone was bashing everyone else and the EU. There was a lot consensus around that. At the moment, she is still analysing data, as there are abundant news and reports on these events. When you are in such an interdisciplinary – multidisciplinary – environment you receive several questions that you did not expect because many of the fellows are from other disciplines. They are interested in different types of research, which result in different kinds of questions. It makes you think about your topic, it gives you that platform to be able to reach other researchers and prepare you for grant submissions that commonly judged by academics from other fields. ©NIAS. Fellow Beatrix Futák-Campbell and her draft paper in her NIAS office.